Stewart’s Melville will be looking for a winning start to the new rugby season when they welcome Gordonians to Inverleith in the first round of the BT National League Cup tomorrow (kick-off 3pm). The Capital side lost their first eight competitive matches last season before discovering their form too late to feature in the race for BT Premiership promotion. They will be desperate to avoid similar issues this time. The new-look competition features the six teams that finished in the lower half of BT National League Division One last season plus all 24 from divisions two and three. As the second-highest ranked side in the competition, Stew-Mel should be looking to progress, but they will take nothing for granted against Gordonians, who have stepped up from the regional leagues. Musselburgh go into action at home to Glasgow Accies looking to build on a solid start to the season that has already yielded silverware. Burgh secured the Jardine Trophy last week with a win over Preston Lodge that has them in good spirits ahead of tomorrow’s clash. Preston Lodge, who have secured the services of prolific points gatherer Brian Walls from Burgh, will be hoping the scrum half’s reliable boot can help them bounce back from last Saturday’s defeat when they welcome near neighbours Lasswade to Pennypit. Elsewhere, Haddington, who are captained this season by centre Liam Clutton will be looking for a positive start to the new campaign when they host West of Scotland at Neilson Park. Meanwhile, the sides not involved in the cup will round off their preparations ahead of next week’s league kick-off. Edinburgh Accies host Heriot’s and Currie meet Blaydon at Malleny Park. 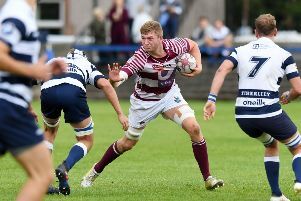 Watsonians face Darlington Mowden Park on the back pitches at Murrayfield (2pm) while Boroughmuir travel to meet Tynedale.